Sorry, I have a derrière-garde education, and dead white men are my wheelhouse. WHAT OCCUPATION has been redacted in the following lines, penned by Sir Walter Raleigh in response to a poem by Christopher Marlowe? "If all the world and love were young, / And truth in every ________'s tongue, / These pretty pleasures might me move, / To live with thee, and be thy love." In an epic poem published in 1847, an Acadian girl named Evangeline Bellfontaine is separated from her beloved, Gabriel Lajeunesse, when the British expel the Acadians from the present-day maritime provinces of Canada, and she wanders the landscapes of America searching for him. WHAT AMERICAN POET wrote this tale? George Bernard Shaw's comedy "Arms and the Man" takes its title from the opening line of a Latin poem by WHAT POET? In a mock-dirge, the Roman poet Catullus urges the gods of love (veneres cupidinesque) to weep for the death of his lover's pet. EITHER give the nickname of Catullus' beloved (whose name does not appear in this excerpt), OR tell what kind of pet (given by the Latin word 'passer') has died. 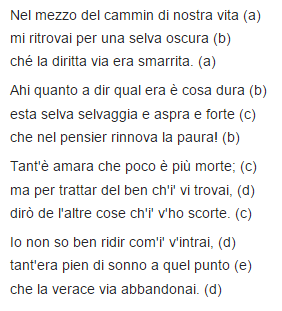 Click the link to see the opening lines in Italian (which I don't actually read) of the Divine Comedy. What is the NAME OF THE VERSE FORM that Dante uses? Percey Shelley also used it in his "Ode to the West Wind." What famous literary CHARACTER is described in these lines? Reginald Fitz Urse, William de Traci, Hugh de Morville and Richard Brito are knights who commit the title action in a verse drama by WHAT PROMINENT POET and literary critic? WHAT VICTORIAN POET is known for being the author of "Pied Beauty" and "The Wreck of the Deutschland," the inventor of "sprung rhythm," and a member of the Society of Jesus? In "end-stopped" poetry, the end of a grammatical unit (phrase, clause or sentence) coincides with the end of a line, and there is usually some mark of punctuation present to denote a pause. 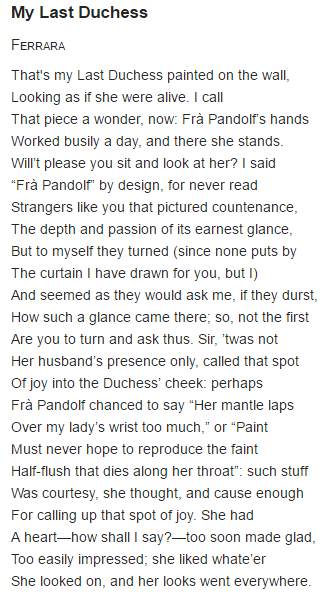 WHAT WORD describes poetry in which phrases and sentences spill over from one line to the next, as they do in most lines of this excerpt from Robert Browning's "My Last Duchess"? Ireland has produced four Nobel laureates in literature. The first and the fourth, chronologically, were poets. (The other two, G. B. Shaw and Samuel Beckett, are best known as dramatists.) NAME EITHER POET. "And did those feet in ancient time / Walk upon England's mountains green: / And was the holy Lamb of God, / On England's pleasant pastures seen!" So begins an anthem used in many Anglican churches on St. George's day, among other occasions. Sir Hubert Parry wrote the tune in 1916. What visionary English POET wrote the words? From the sublime to the ridiculous, what naturalized American "POET" wrote the lines, "It takes a heap o' livin' in a house t' make it home, / A heap o' sun and shadder, an' ye sometimes have t' roam / Afore ye really 'preciate the things the things ye lef' behind, / And hunger for 'em somehow, with 'em allus on yer mind"? Dorothy Parker once quipped, "I'd rather flunk my Wasserman Test than read a poem by [this man]."